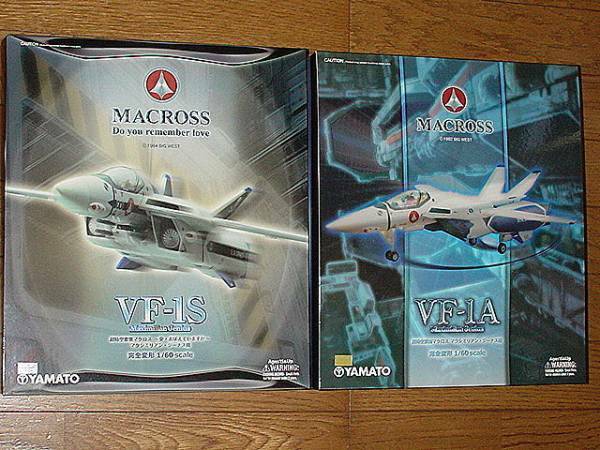 The Toyark › Macross Toy News › Yamato Macross 1/60 VF-1A & VF-1S Max Customs Released! Yamato Macross 1/60 VF-1A & VF-1S Max Customs Released! 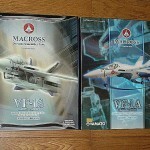 The Macross 1/60 scale TV VF-1A Max Custom, and Macross Do You Remember Love? VF-1S Max Custom(Skull 1) by Yamato have been released! Ace pilot Max Jenius is one of the most popular characters in Macross, and these toys are based on his specific VF-1‘s that he used in pivotal events in Macross. In the Macross TV series, his VF-1A was the first Valkyrie that he is shown using, and he used this to rescue his team mates against all odds. He later used it to defeat the Zentraedi ace, Milia, in one of the most popular episodes of the series. In Macross Do You Remember Love?, his VF-1S is only seen onscreen for less than 10 minutes, first seen leading a section of the Skull Squadron. The ensuing battle is one of the most famous in all of Macross, and is one of the scenes he is known by. In an intense duel, he proves his worth as Skull Leader, leaving many fans with mouths agape; shocked at his incredible display of skill. This is the very first time that Max’s TV VF-1A & movie VF-1S have been made into toys. For many fans of Max, it’s been a long time coming! Dear god I hope the hinges are fixed! I've been waiting for a TV Max for a VERY LONG TIME! Call me a blasphemer but I always liked Max's VF-1J more than his VF-1S and VF-1A. I guess it's because I always see Max and Miriya's all blue and all red VF-1J's as their definitive valkyries. Question though, are these 1/60's transformations more anime accurate than the 1/48's or do they have the same transformation process as the 1/48's? Not necessarily more accurate, transformation is very similar, except that for the shoulder hinges, when going from fighter to gerwalk, it's best to gently lift the hinge above the stopper instead of pushing it past like on the 1/48. The 1/48 with POM hinges can take it, but the new 1/60's hinges are more likely to crack due to this. Even so, there isn't much to stop this, these Max releases are supposed to have smaller diameter pins installed in the shoulders so maybe that'll help. We'll find out soon. The nose hatch is different and trickier to work, however not as bad as people have said. To be honest I don't see what the goal was with the new hatch, as the hatch on the 1/48 worked just fine. A lot of people do. I'm all about awesome valks, and his 1J is definitive to many fans, but for me, combat relevance is my preference when it comes to Macross. His 1A was the one he flew when he beat Milia and showed his true skills. His 1S in DYRL? was AWESOME! Good god that dogfight was one of the best in all of Macross. The only thing that ever came close was Guld and Isamu's last dogfight in Macross Plus and that didn't happen until over 10 years after DYRL?. Only Roy should be allowed to fly the VF-1S! It seems like Yamato and Bandai have a knack for doing stuff like that. It always makes me hesistate to buy. They look great! Damn, I'm tempted to buy both now....I love the scenes that both were involved in, who could forget Max's dogfight in DYRL? EPIC! Now his 1A I've wanted for a long time now, I really hope the hinges are fixed, because if so, this one will be bought later this year! DYRL? made it look cool, and Yamato made it look awesome in toy form. I wasn't a fan when I was younger but when I grew older, I ended up liking it a lot more. Maybe if the cannon was swept back I'd like it better but most pics I see have it angled forwards. It can go either way, most people angle it forward because DYRL made it look cool that way. I should get a 1/48 VF-1A someday just so I have all the main ones. Which one are you getting? Max, Hikaru, low viz 2? Ideally I'd like to get the VF-1A Hikaru since I don't have a 1/48 for him yet. But the Kakizaki is pretty cheap on eBay right now. I can't make a decision! HELP! I really like them all: VF-1J, VF-1S, VF-1A, VF-1A TV Ver. Yamato has really pushed the envelop with these new line of 1/60 Valks. if they do, I might have to star putting something aside, this is tempting. They have, they just really need to fix the hinges. I'd got for Hikaru right now, looks splendid, and had memorable scenes in the movie. One Kakizaki would be $129 shipped. The other would be about $142 shipped. I think Kakizaki will be hard to get rid of, his valk was barely in DYRL?, and he's not the greatest of characters. I'd bite the bullet and pay the $13 more for Hikaru. Oh no, I meant there was two Kakizakis. Hikaru is more like $200+ shipped. Wait a sec. The Hikaru DYRL 1A is $200 shipped? Holy crap. Anyway, are the TV heads actually TV accurate or are they still just DYRL repaints? And how are you guys deciding what to buy in 1/48 vs 1/60 scale? The only 1/48 Hikaru VF-1A I've seen is from HLJ and it's about $190 shipped. I can't find any on eBay. As for deciding on what scale, I go for the 1/48's simply because I like the sheer size of the figures. It's just that impressive to me. Yeah, I hope they do fix them but I will wait for confirmation. Full Thread: Yamato 1/60 VF-1A/S MAX Customs Released!